If you could only do one thing in Japan, what would it be? 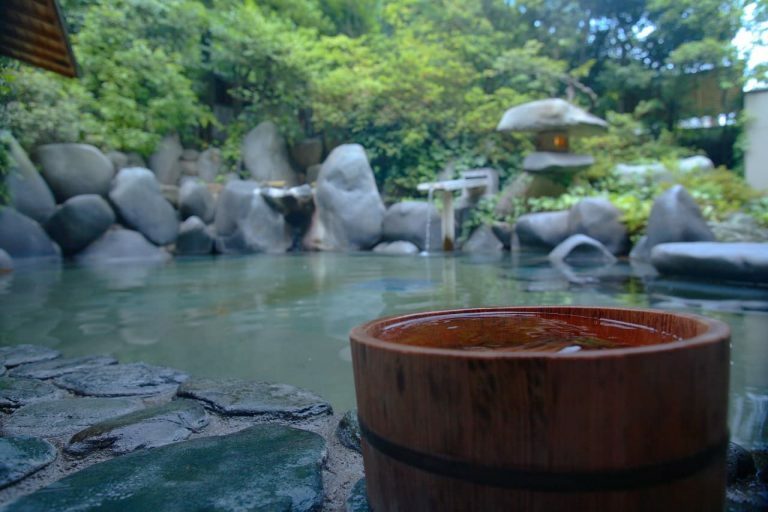 Singapore may have our very own Sembawang Hot Spring, but you cannot call yourself a true-blue onsen lover if you haven’t been to the one in Japan. For a conservative Singaporean like me to strip off and bathe in onsen with a bunch of old Japanese ladies, it was quite a nerve-wrecking experience. So, to save you the awkwardness and prepare for what you will find lurking among the steam, I’ve prepared this ultimate guide to onsen. Even if you are an experienced onsen go-er, there are still many unknown facts about this miraculous hydrotherapy. Ever heard of onsen water turning black or even red? How weird is that! But I have uncovered the mysterious reason why these waters are changing. 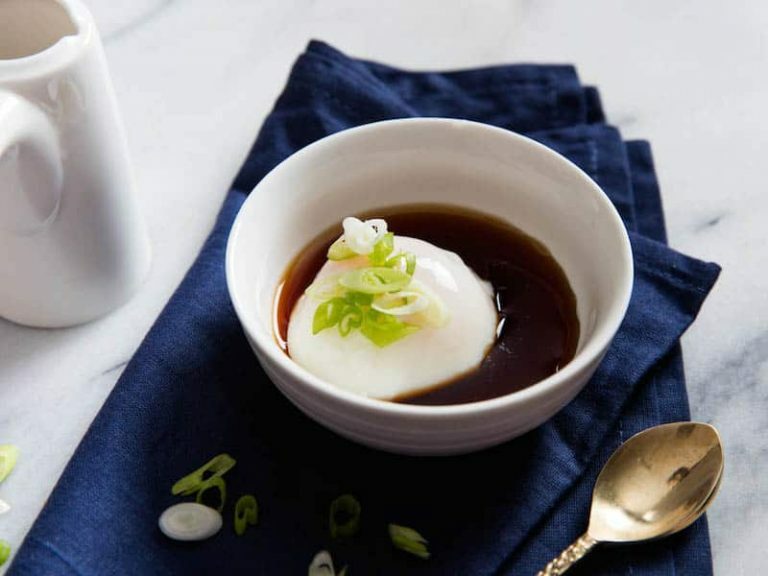 Also, if you ever think about savoring an onsen egg while soaking in Japanese onsen, I am going to show you how to whip up this delicious onsen egg recipe at home. Read on! Onsen (温泉), is a Japanese hot spring that comes in many types, sizes and shapes. Japan is a volcanically active country. For this reason, there are thousands of onsen around the island. 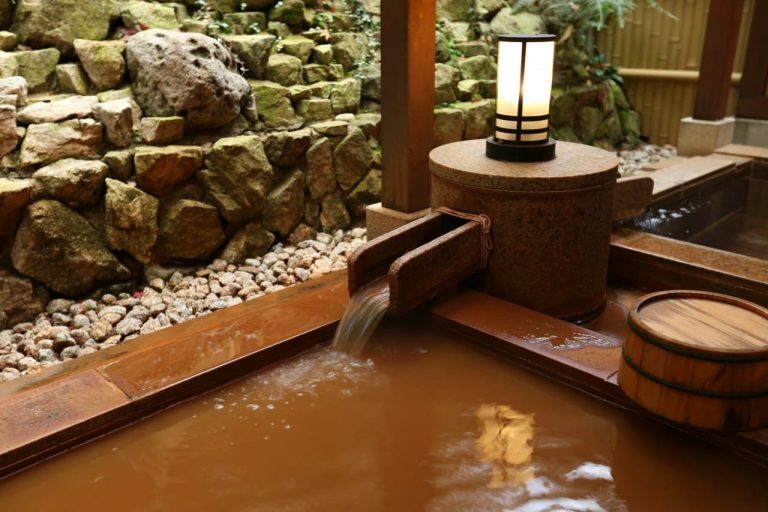 Back in the 12th century, bathing in onsen started due to the influence of Buddhism. 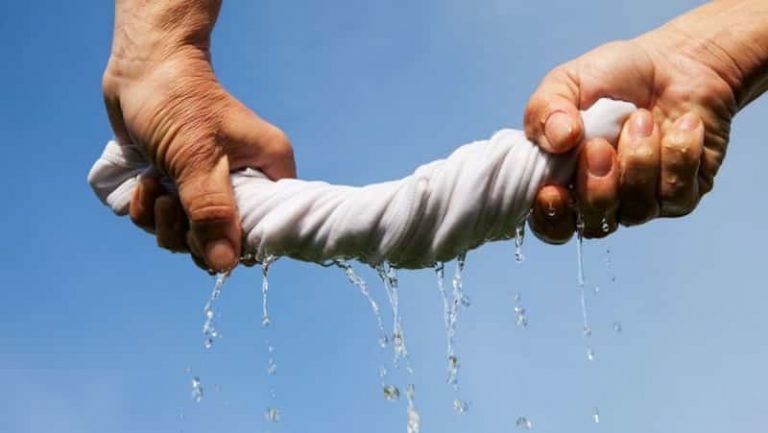 Buddhists believe that by immersing one’s body in the ‘divine’ waters, the bather allows it to be cleansed of the sins of the flesh, and the good will of the deities is conferred upon him or her. In the 17th century, people started recognizing health benefits, attracting travelers to the hot spring. During Winter Solstice, tangy fruits such as yuzu will be placed in the onsen to ward off colds in the coming winter! 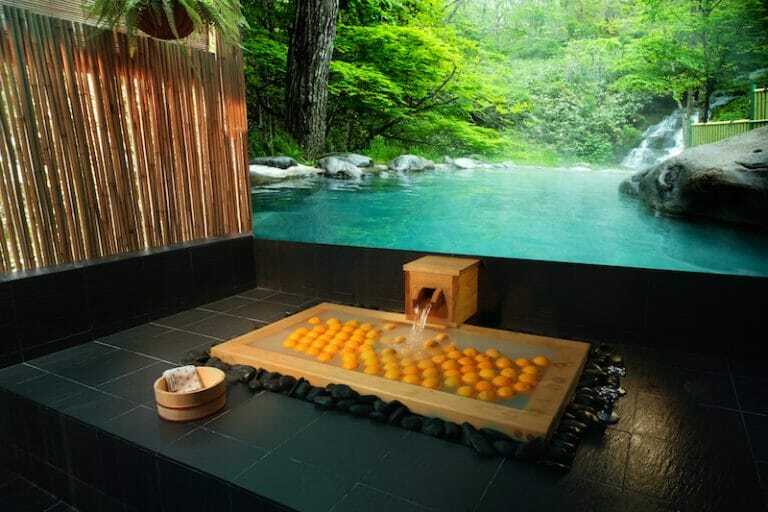 And they add a citrusy and refreshing fragrance to enhance the entire hot spring experience. No doubt they have always been an important part of the Japanese’s lives, ingraining in their culture whereby they will want the best quality of their baths, and will always take a good bath to end a busy day. Even having a retreat getaway on an onsen trip is among one of their top priorities, to just bath, relax and cherish the moment. When soaking in onsen, there are rules to follow before, after and during onsen! Take note, otherwise you might have to leave the onsen without even getting the chance to dip your toes in. Before entering the onsen, washing yourself squeaky clean is the foremost step to take. This is extremely important to prevent the onsen water from being dirtied. Can you imagine if everyone just soaks into the onsen without washing up? I wouldn’t want to! However, it is highly recommended to cool your body down with cool water before entering the warm onsen. Picture perfect memories, I understand that. But save your Instagram for later, well, this is not the place to be photobombed. An onsen is a place for everyone to relax and not be wary about who is going to snap a photo. Accidentally drop your towel into the onsen and attempting to dry it? Don’t wring it in the onsen! Wringing your perspiration into the water is an unhygienic act. Instead, take it out of the onsen and wring it. Otherwise, ask for a new towel if needed. If you’re shy about going naked and decide to bring a swimsuit along, you will not be allowed to enter the onsen. As one local Japanese told me, “You go in as you came into this world”. Did I mention you’ll be naked? Remove even your undergarments before entering! Thankfully, in Ikeda Spa, an onsen in Singapore, we provide disposable undergarments for the onsen beginners!  #FunFact 1: In Japan, there is a phrase – 裸の付き合い (Hadaka No Tsukiai) which means ‘naked friendship’. To them, they will only reveal their body to people who they truly trust in. Barriers are broken down once you are naked, and it should be a good chance to relax and talk opening and honestly with one another. Ladies or men who have long locks, make sure that you tie your hair up! The bath is meant for soaking your body only. Therefore, for sanitary purposes, avoid having your hair touching the water. In Japan, tattoos are uncool as they relate it back to gangster ties. Therefore, people with tattoo are prohibited from entering a communal onsen. 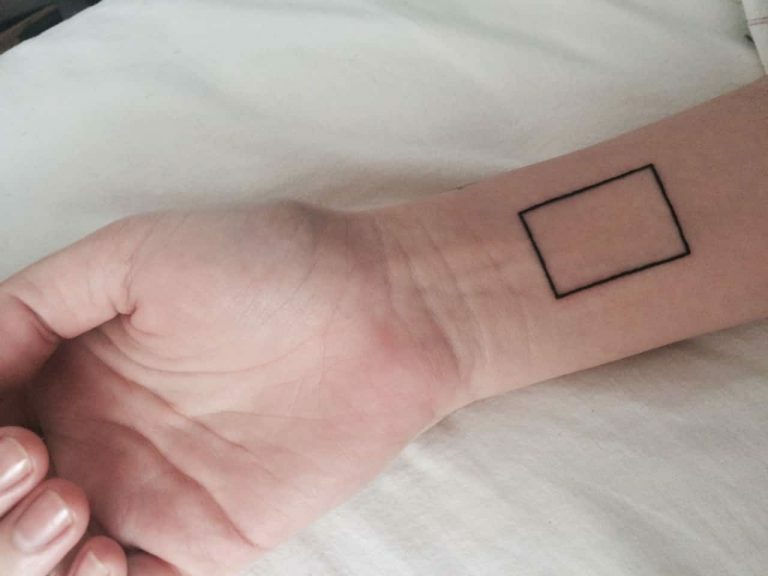 Just a tiny small tattoo of your birth date? You will still be forbidded entry. That’s not the end of the world, those who are body inked can opt for a private onsen in a typical onsen resort. 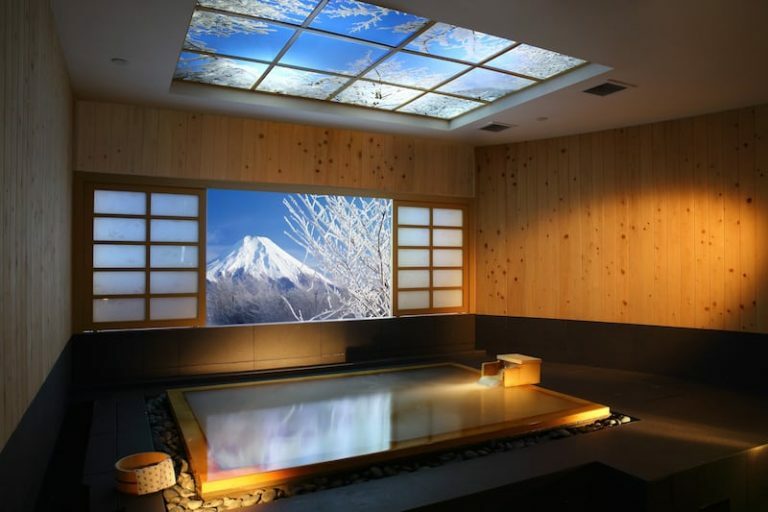 Being a kiasu Singaporean, I would hope to soak in the onsen for the longest possible time. However, the longer you soak does not equate to increasing nutrients being absorbed into our body. The recommended duration does not go up to more than 15 to 20 minutes. Soaking in a hot-temperature water for too long will excessively raise blood pressure or heart rate, causing dizziness and discomfort. Therefore, once you feel uncomfortable, step out and hydrate yourself immediately. Otherwise, soak for 15 minutes and leave the onsen for a cold bath before entering again.  #FunFact 2: Notice people placing small towels above their head? While soaking onsen, heat will get into our body and go up to our head. The main purpose of the towel is to retain the heat from leaving our body and at the same time, cool down our head to prevent dizziness. Not seeking for any relaxation? 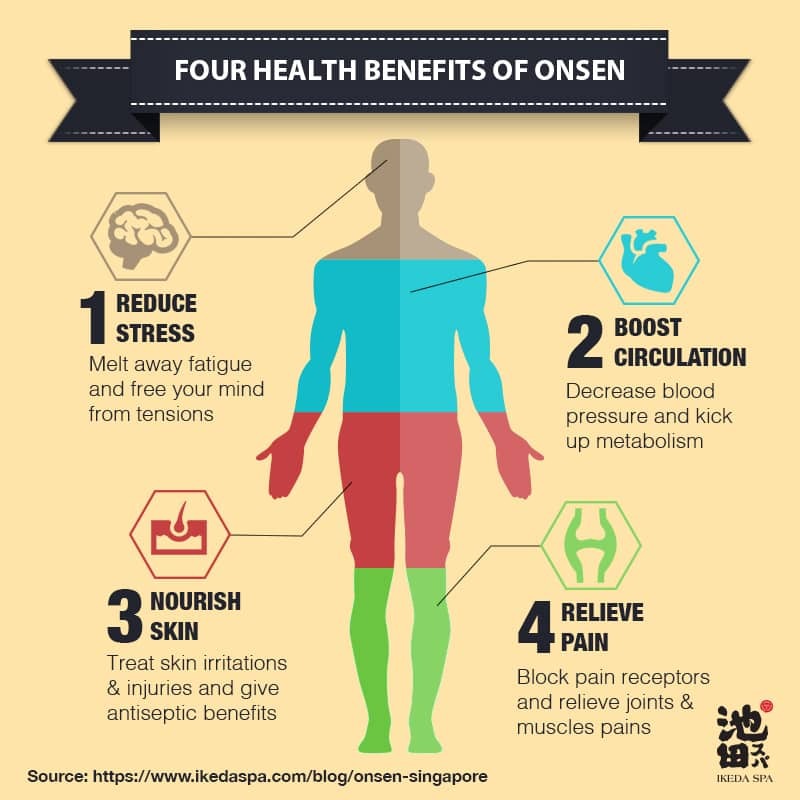 Then soak for the health benefits that onsen can provide! With numerous benefits, you do not have to worry about not finding an excuse to go for a soak. Let’s explore the health benefits. Warm bath generally aids in unwinding oneself after a stressful day. In addition to that, hinoki wood, the material commonly used to make traditional Japanese onsen tubs, also helps in reducing stress. Once in contact with hot water, this Japanese cypress wood releases hinoki wood oil that relieves anxiety and promotes a sense of balance. The essential oil is widely used in aromatherapy to help reduce the stress accumulated from school, work or even life. 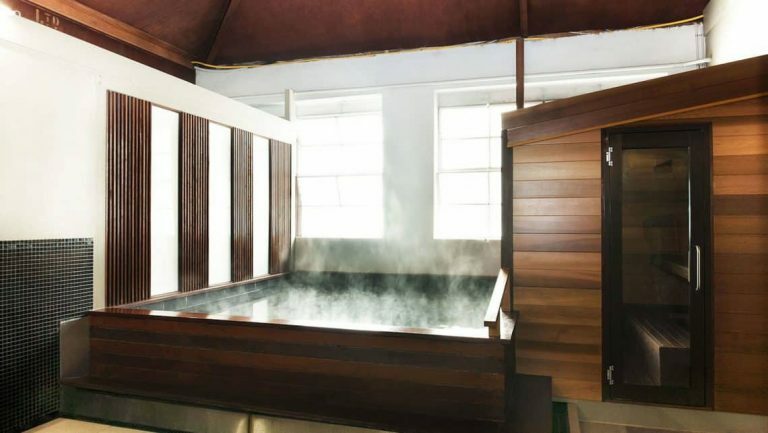 The synergy of hot water and hinoki wood is perfect solution for melting tension away.  #FunFact 3: Other than reducing stress, do you know that hinoki wood oil acts as a decongestant of the respiratory system that cures asthma and other nervous system ailments? While we decide to relax and free our mind off from stressful things, we will recover from fatigue as well. In return, reducing more stress. 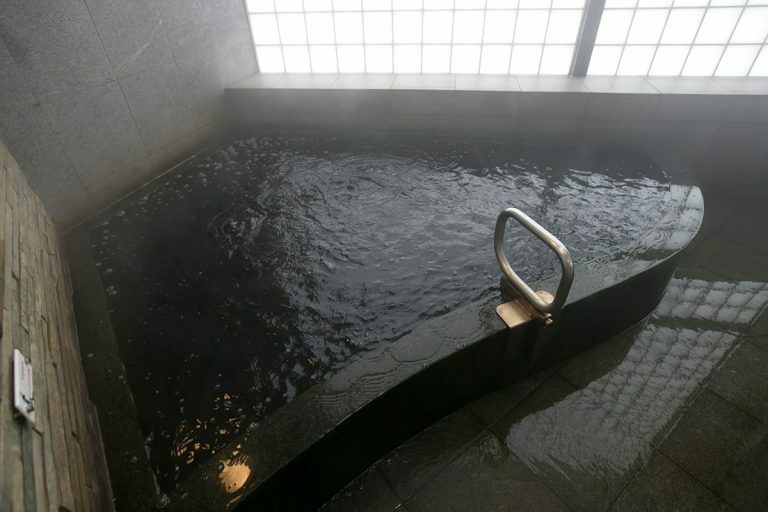 Researchers from Japan found that soaking subjects who had chronic heart failure in hot springs actually lead to a decrease in blood pressure and improved their symptoms. As you sit in the onsen, your blood pressure drops, your blood circulation goes up and your metabolism kicks up a bit. You’ll probably feel a little funny too at first, but eventually, your body automatically adjusts to the temperature and all is right in the world. Onsen that uses hinoki wood is perfect for sensitive skin as it is gentle on the skin. In Japan, this Japanese cypress wood’s essential oil is traditionally used to treat skin irritations and injuries due to the antiseptic benefits that it has. Being highly therapeutic with essential oils in it, it gives restoration treatments. 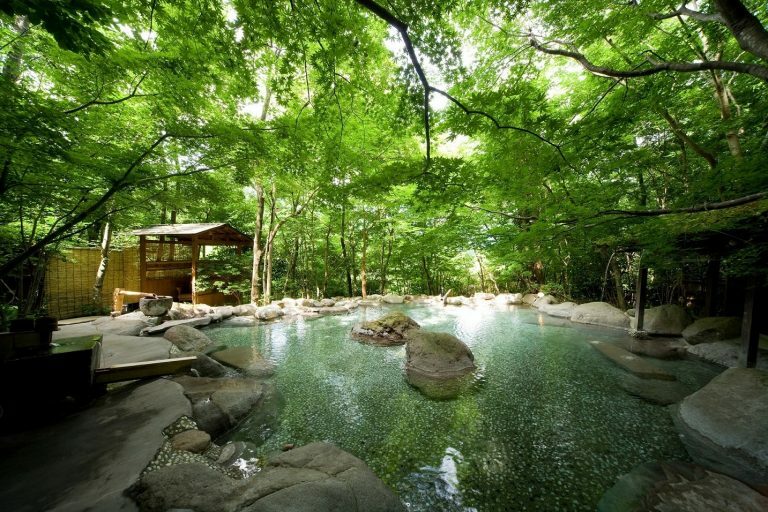 When bathing in the hinoki onsen, our skin will soak up all the goodness, making it feel soft and glowing.  #FunFact 4: Soap, antiseptics, perfume, cosmetics and even hair treatments use minerals and essential oils of Hinoki Wood! Just imagine the benefits it can give you just by going for an onsen. As you so cleverly deduced, hot springs are generally pretty hot, typically measuring from 37-degrees Celsius to 42-degrees Celsius. This heat, although sometimes intense, can help relieve pain. 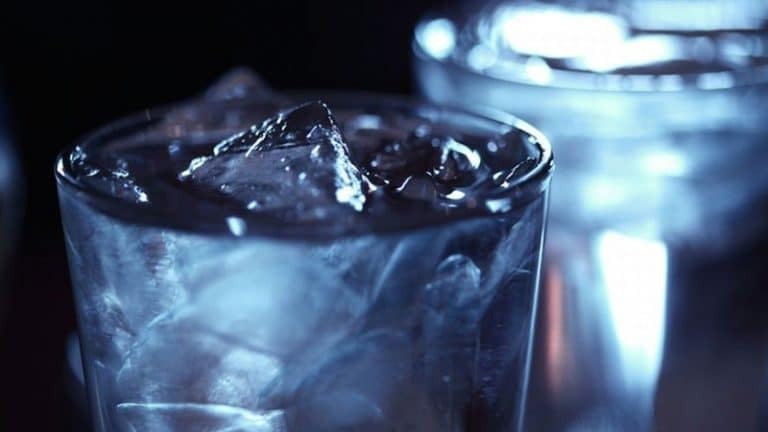 The way it works is that the heat along with the pressure of the water dulls our perception of pain by blocking the pain receptors in our bodies. Moreover, the mineral concentration and hot water can make you feel “floatier”, which has positive effects on your joints and muscles, working together to help you feel good and – more importantly – more relaxed. 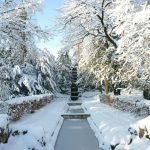 A review in Rheumatology revealed that spa therapy and balneotherapy, which is the the “treatment of disease by bathing”, may be able to help relieve lower back pain, especially at higher temperatures. Onsen Tamago 温泉卵 literally means ‘hot spring eggs’ in Japanese. It refers to eggs that were originally prepared in hot spring water to create silky egg whites and custard-like yolk. For those of you in Malaysia and Singapore, who are familiar with half boiled eggs, onsen egg is just ever so slightly firmer. No need to bring these eggs to onsen, you just need a cook pot to make these delicious onsen tamago at home! Fill your pot with water, boil till water starts to rolling boil. Remove pot from the heat. Wait for 1 minute and place cold eggs into the water without covering the pot with a lid. Do not try to move eggs. After 12 minutes, remove the eggs carefully and put it back into ice cold water. Make sure to cool the egg for 5-10 minutes until it has completely cooled all the way through, and it’s done. Gently crack the egg open and the egg will roll right out. Do not crack open from a height, otherwise, the egg white will separate from the egg yolk. Think that the colour of every onsen is clear? Think again. Do you know that the color of water changes depending on the elements? Onsens in Japan come in a variety of colors, giving different features and benefits. Regrettably, Sembawang Hot Spring only has one color. Therefore, let us check it out! A milky white onsen water is also known as Lou-sen water. Sulfur is the element that turns the water into a milky white color. When the fine particles are unable to dissolve, they get exposed to the environment and oxidize with hot water. Although they are colorless and transparent. But when in contact with air, they turn clear water to a beautiful milky white hue. Unsure if you are soaking in the Lou-sen water? Once you smell a rotten egg scent, you know you are soaking in the milky white onsen water. Are you amazed yet? Just look at how beneficial it is to our body. In Japan, many onsen places that claim to have great water has this Lou-sen water. That makes it a very common type of onsen in Japan. This reddish-brown onsen water, Gantetsu-sen water. The element that turns the water into this color is iron. Similarly, iron are colorless and transparent like sulphur. When oxidized, they turn the water chalky and change the color reddish brown after that. Notable features will be the water smelling like rust. Although I won’t advise you to taste the water, however, if you are more adventurous and decided to try it, it will taste bitter. Having known for bringing positive effects mainly for women, some call the water Fujin-no-yu, know as Water of Women. Definitely not pleasing to the eyes, this is Kuroyu or “Beautiful Skin Spring”, the black onsen. The cold mineral spring of humic acid turns the water black. The size of the particles will be the result of the transparency and color of the onsen water. Bigger sized particles turn the water black and opaque while smaller sized particles turn the water light-black and transparent. Indeed a beautiful skin hot spring to improve your skin. Moreover, all you have to do in just soak your body in and relax! This green onsen water is known as Moor Onsen due to the composition of organic vegetative substances. 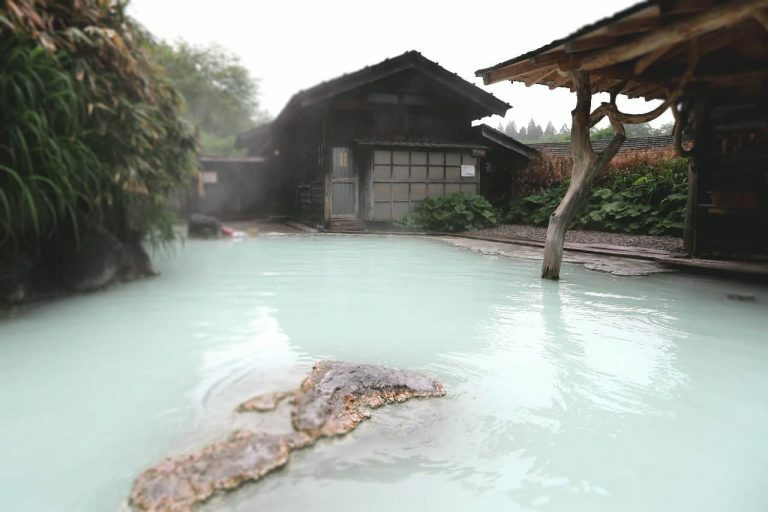 The soothing and light green onsen of Moor Onsen contains fulvic acid, sodium hydrogen bicarbonate, and sulfur. However, the mechanism of the tone of the water is still unclear. Helping with skin renewal by removing dead skill cells and giving you anti-ageing skin properties, the “Hot Spring of Beauty” sure keeps your skin protected! 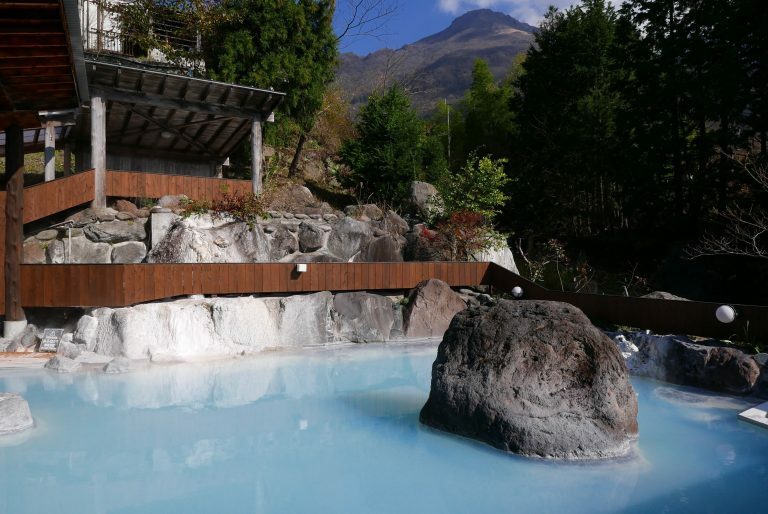 This blue onsen water is actually a combination of milky blue and milky white water. However, just like the green water, the mechanism of the blue water has not been clarified yet. Thus, it is only said that silicic acid and sulfur component are both related in leading to the water turning blue in color. Do You Know That Ikeda Spa is the First Onsen in Singapore? Are you excited to visit an onsen now? Can’t wait for your next trip to Japan? But you can always come to Ikeda Spa for your regular dosage of onsen goodness. If you want to experience large public onsen bath, come and soak in our communal onsen at Ikeda Spa Prestige, Clarke Quay. Or you want a more private time with your loved one, we have private onsen and couple onsen at Ikeda Spa, Bukit Timah. Did I mention that the onsen bath is free if you book any 90 minutes treatment at Ikeda Spa? 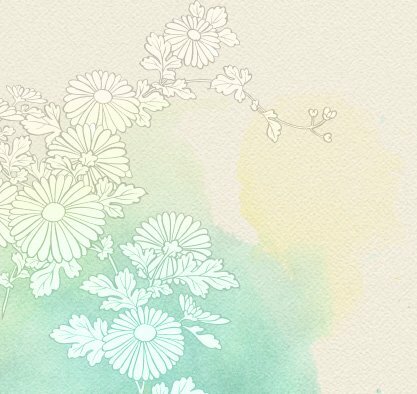 Or click on the banner below to claim for your free onsen when you refer 5 friends to sign up for our newsletter.